A Doctor of Medicine (M.D. from Latin Medicinae Doctor) is a medical degree, the meaning of which varies between different jurisdictions. In the United States, Canada and other countries, the MD denotes a professional graduate degree awarded upon graduation from medical school. In the United Kingdom, Ireland and other countries, the MD is a research doctorate, higher doctorate, honorary doctorate or applied clinical degree restricted to those who already hold a professional degree in medicine; in those countries, the equivalent professional degree is typically titled Bachelor of Medicine, Bachelor of Surgery (MBBS). A feminine form, "Doctress of Medicine" or Medicinae Doctrix, was also used by the New England Female Medical College in Boston in the 1860s. In most countries having a Doctor of Medicine degree does not mean that the individual will be allowed to practice medicine. Typically a doctor must go through a residency for at least four years and take some form of licensing examination in their jurisdiction. In Afghanistan, medical education begins after high school. No pre-medicine courses or bachelor's degree is required. Eligibility is determined through the rank applicants obtain in the public university entrance exam held every year throughout the country. Entry to medical school is competitive, and only students with the highest ranks are accepted into medical programs. The primary medical degree is completed in 7 years. According to the new medical curriculum (from 2016), during the 12th semester, medical students must complete research on a medical topic and provide a thesis as part of their training. Medical graduates are awarded a certificate in general medicine, regarded "MD" and validated by the "Ministry of Higher Education of Afghanistan". All physicians are to obtain licensing and a medical council registration number from the "Ministry of Public Health" before they officially begin to practice. They may subsequently specialize in a specific medical field at medical schools offering the necessary qualifications. After graduation, students may complete residency. The MD specification: Before the civil wars in Afghanistan, medical education used to be taught by foreign professors or Afghan professors who studied medical education abroad. The Kabul medical institute certified the students as "Master of Medicine". After the civil wars, medical education has extremely changed, and the MD certification has been reduced to "Medicine Bachelor". In Argentina, the First Degree of Physician or Physician Diplomate (Spanish: Título de Médico) is equivalent to the North American MD Degree with six years of intensive studies followed by usually three or four years of residency as a major specialty in a particular empiric field, consisting of internships, social services and sporadic research. Only by holding a Medical Title can the postgraduate student apply for the Doctor degree through a Doctorate in Medicine program approved by the National Commission for University Evaluation and Accreditation. Historically, Australian medical schools have followed the British tradition by conferring the degrees of Bachelor of Medicine and Bachelor of Surgery (MBBS) to its graduates whilst reserving the title of Doctor of Medicine (MD) for their research training degree, analogous to the PhD, or for their honorary doctorates. Although the majority of Australian MBBS degrees have been graduate programs since the 1990s, under the previous Australian Qualifications Framework (AQF) they remained categorized as Level 7 Bachelor's degrees together with other undergraduate programs. The latest version of the AQF includes the new category of Level 9 Master's (Extended) degrees which permits the use of the term 'Doctor' in the styling of the degree title of relevant professional programs. As a result, various Australian medical schools have replaced their MBBS degrees with the MD to resolve the previous anomalous nomenclature. With the introduction of the Master's level MD, universities have also renamed their previous medical research doctorates. The University of Melbourne was the first to introduce the MD in 2011 as a basic medical degree, and has renamed its research degree to Doctor of Medical Science (DMedSc). In French-speaking Belgium, the medical degree awarded after six years of study is "Docteur en Médecine". Physicians would then have to register with the Ordre des Medicins to practice medicine in the country. At the end of the six-year medical programs from Bulgarian medical schools, medical students are awarded the academic degree Master in Medicine and the professional title Physician - Doctor of Medicine (MD). This section contains Khmer text. Without proper rendering support, you may see question marks, boxes, or other symbols instead of Khmer script. After 6 years of general medical education (a foundation year plus 5 years), all students will graduate with a Bachelor of Medical Sciences (BMedSc, Khmer: បរិញ្ញាប័ត្រ វិទ្យាសាស្រ្តវេជ្ជសាស្ត្រ), equivalent to Bachelor of Science, Bachelor of Surgery (MBBS). This degree does not allow graduates to work independently as a physician, but it is possible for those who wish to continue to master's degrees in other fields relating to medical sciences such as public health, epidemiology, biomedical science, and nutrition. General Practitioner's (GP) course of 8 years (BMedSc plus a 2-year internship). Clinical rotation in the internship is modulated within four main disciplines (general medicine, surgery, gynecology, and pediatrics). The medical degree awarded is Doctor of Medicine (MD, Khmer: បណ្ឌិតវេជ្ជសាស្ត្រ ឬ វេជ្ជបណ្ឌិត) – equivalent to a master's degree [?]. After graduating with BMedSc; any students who wish to enter a Residency Training Program, are required to sit for an Entrance Exam. The duration of residency programs takes 4 years after either BMedSc or MD (BMedSc or MD plus 4 years of specialization). Once the graduates have successfully defended their practical thesis, they are awarded the Degree of Specialized Doctor (MD with specialization, Khmer: សញ្ញាប័ត្រ៖ វេជ្ជបណ្ឌិតឯកទេស, lit. 'Professional Doctorate'). All medical graduates must complete a Thesis Defense and pass the National Exit Exam (Khmer: ប្រឡងចេញថ្នាក់ជាតិក្នុងវិស័យសុខាភិបាល) to become either GPs or medical or surgical specialists. In Canada, the M.D. is the degree required to practice medicine. McGill University Faculty of Medicine is the only medical school in Canada that continues to award the M.D., C.M. degrees (abbreviated M.D.C.M.). M.D.C.M. is from the Latin Medicinae Doctor et Chirurgiae Magister meaning "Doctor of Medicine and Master of Surgery". Upon graduation, students enter into a residency phase of training. Prior to obtaining an independent practicing license from a provincial regulatory body, students must complete the Medical Council of Canada Qualifying Examination to obtain the Licentiate of the Medical Council of Canada (LMCC) qualifications. In Croatia, the title of "doktor medicine" (abbreviated "dr. med.") is awarded upon completion of six years of study at a Faculty of Medicine ("medicinski fakultet") immediately after high school. In the Dominican Republic, it is known as "Doctor en Medicina" (Doctor in Medicine). In 1511 the Spanish Catholic church founded the first university of the Americas in Santo Domingo present capital of modern-day Dominican Republic and name it Universidad Santo Tomas de Aquino (today Universidad Autonoma de Santo Domingo). In 1630 this university graduated the first medical doctors of the Americas and amongst the graduates some Native Americans included. After graduating from high school with a Baccalaureat, any student can register at a university of medicine (there are about 30 of them throughout the country). At the end of first year, an internal ranking examination takes place in each of these universities in order to implement the numerus clausus. First year consists mainly of theoretical classes such as biophysics and biochemistry, anatomy, ethics or histology. Passing first year is commonly considered very challenging, requiring hard and continuous work. Each student can only try twice. For example, the Université René Descartes welcomes about 2,000 students in first year and only 300 after numerus clausus. The second and third year are usually mainly quite theoretical although the teachings are often accompanied by placements in the field (e.g., internships as nurses or in the emergency room, depending on the university). During fourth, fifth and sixth years, medical students get a special status called "externe" (In some universities, such as Pierre et Marie Curie, the externe status is given starting in the third year). They work as interns every morning at the hospital plus a few night shifts a month and study in the afternoon. Each internship lasts between three and four months and takes place in a different department. Med students get five weeks off a year. At the end of the sixth year, they need to pass a national ranking exam, which will determine their specialty. The first student gets to choose first, then the second, et cetera. Usually, students work hard during fifth and sixth years in order to train properly for the national ranking exam. During these years, actual practice at the hospital and some theoretical courses are meant to balance the training. Such externs' average wage stands between 100 and 300 euros a month. After that ranking exams, students can start as residents in the specialty they have been able to pick. That is the point from which they also start getting paid. 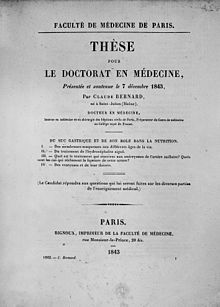 Towards the end of the medical program, French medical students are provided with more responsibilities and are required to defend a thesis; however, unlike a PhD thesis, no original research is actually necessary to write an MD thesis. At the conclusion of the thesis defense, French medical students receive a State Diploma of Doctor of Medicine (MD, French: diplôme d'Etat de docteur en médecine). Every new doctor must then proceed to a Diploma of Specialised Studies (DES, French: diplôme d'Etudes spécialisées) to mark their specialty. Some students may also receive a Diploma of Complementary Specialized Studies (DESC, French: diplôme d'Etudes spécialisées complémentaires). After at least six years of medical school, the students graduate with a final federal medical exam (Dritter Abschnitt der ärztlichen Prüfung). Graduates receive their license to practice medicine and the professional title of physician (Arzt). About 80% of them additionally obtain the academic MD-like degree Doctor of Medicine (Dr. Med.). The corresponding "doctoral" dissertations are often written alongside undergraduate study. Obtaining the title is a practical necessity because many medical laypersons incorrectly assume that a doctorate is required for the practice of medicine. The European Research Council decided in 2010 that those Dr. med. doctorates do not meet the international standards of a PhD research degree. In Guyana, Doctor of Medicine (MD) degree is awarded after the completion of 4 years or 5 years of study. Texila American University, Green Heart University, American International School of Medicine, Alexander American University, Lincoln American University provides medicine programs. In Hungary, after six years of medical school, which include a sixth-year internship, students are awarded the degree of 'OrvosDoktor' (Doctor of Medicine) degrees. In Indonesia, the title of "dokter" (dr.) is awarded after 3-3.5 years of study (at least) and 1.5–2 years of clinical course in university hospitals. After a medical student finished those five years of study, they need to take "Uji Kompetensi Mahasiswa Program Profesi Dokter" (UKMPPD). If they pass the test, they can take Hippocrates Oath and the title of Dokter (dr.) is entitled before their name. Then they need to take a year-long internship course in primary health care clinics (also known as Puskesmas) or primary hospitals all over the country to practice as general practitioner under supervision of senior doctors. Those who wished to further their study into specialties can take graduate course of medicine of their preference and will be entitled with "Specialist of ..." after their name (e.g. : Sp.A for Spesialis Anak = Pediatrician). Graduate course of medicine is equal with residency program which is required the candidates to study for four years and hospital internship. Note that "dr." is used for medical graduates, while Dr. (or wrongfully DR., Doktor) is used for PhD holders. In Iran, Medical education begins after high school. No pre-med course or BSc degree is required. The eligibility is determined through the rank applicants obtain in the public university entrance exam being held every year throughout the country. The entry to medical school is competitive and only students with the highest rank are accepted into medical program. The primary medical degree is completed in 7–7.5 years. On the final years (last 1–2 years) medical students need to do a research on a medical topic and provide thesis as part of their trainings. Medical graduates are awarded a certificate in general medicine, called "Professional Doctorate in Medicine" validated by the "Ministry of Health and Medical Education of Iran". All physicians will obtain license and medical council registration number from the "Medical Council of Iran" before they officially begin to practice. They may subsequently specialize in a specific medical field at medical schools offering the necessary qualifications. There are five university medical schools in Israel, including the Technion in Haifa, Ben Gurion University in Be'er Sheva, Tel Aviv University, the Hebrew University in Jerusalem and the Medical school of the Bar-Ilan University in Safed. They all follow the European 6-year model except Bar-Ilan University, which has a four-year program similar to the US system. However, as of 2009, Tel Aviv University has introduced a four-year program similar to the US system for students with a bachelor's degree in certain biological sciences. The entrance requirements of the various schools of medicine are very strict. Israeli students require a high school Baccalaureate average above 100 and psychometric examination grade over 740. The demand for medical education is strong and growing, and there is a lack of doctors in Israel. The Technion Medical School, Ben Gurion University, and Tel Aviv University Sackler Faculty of Medicine offer 4-year MD programs for American students who have American college degrees and have taken the MCAT interested in completing rigorous medical education in Israel before returning to the US or Canada. In Israel, the degree of Doctor of Medicine (MD) is considered to be equivalent to a Master's degree academically and legally. In Italy, the title of "Dottore in Medicina e Chirurgia" (literally Doctor in Medicine and Surgery, from the Latin Medicinae Doctor et Chirurgiae Magister meaning "Doctor of Medicine and Master of Surgery ) is awarded after completion of a Master's course in medicine and surgery (lasting at least six years of study and clinical training) in a university and after the submission of a thesis, that consists of a new research undertaken. After obtaining this degree, graduates do not have a licence to practice, that is awarded only after an additional period (at least 6 months-1 year) of study and clinical training and after passed a state examination (called "abilitazione alla professione medica", which translates to habilitation exam to medical practice) through which they acquire the full licence to practice and the right to work as a medical doctor. Admission to medical school is highly competitive, based on a ranking examination in order to implement the numerus clausus. Only about 15%  of applicants pass this examination and has the right to register at a university of medicine. Spurred by the Bologna process, a major reform was instituted in 1999 to align University programmes with the more universal system of undergraduate (Bachelor's degree) and postgraduate studies (Master's and Doctoral degrees). In this context, the new Laurea Magistrale a ciclo unico in Medicina e Chirurgia is a six years second cycle degree, equivalent to a master's degree (360 ECTS credits) which can be earned in a six-year programme and requires a scientific research thesis. Consequently, the degree of Doctor of Medicine (MD) in Italy is considered to be equivalent to a Master's degree academically and legally . In Japan, the title "Doctor of Medicine (MD)" is awarded by the government, after graduating from a medical university or college with a 6-year curriculum and passing the national examination. In Latvia, the duration of basic medical education is six years and the course leads to the degree of Doctor of Medicine. In Malaysia, MD are awarded by both private and public universities, mostly are trained as a 5-year course, however with the establishment of Perdana University, it became the first university in Malaysia to provide a 4-year graduate entry course. Examples of universities in Malaysia offering the M.D degree are University Sains Malaysia, National University of Malaysia, University Putra Malaysia, UCSI University, etc. In the Philippines, the MD is a first professional degree in medicine. In order to be accepted in Philippine medical schools, one must have finished a college degree before one can proceed to have a medical education. It is attained by either completing a 4-year degree or a 5-year degree (with internship included) from an accredited institution by the Association of Philippine Medical Colleges and the Commission on Higher Education. An MD degree does not permit the practice of medicine but qualifies the degree-holder to apply for registration to the Professional Regulatory Commission. Registration to the Commission through completion of internship and examinations will grant the privilege of practicing medicine in the Philippines. In Poland the title of lekarz (physician, medical doctor) or "lek." is granted after completing a 6-year medical program (students apply to it directly after graduating high school). Many medical schools in Poland also offer medicine programs in English, which award the Doctor of Medicine (MD) degree. In contrast, a higher doctoral academic research degree in medicine resembling a PhD is named "dr n. med." or doktor nauk medycznych (Doctor of Medical Sciences). Specialization is valued similarly to a specialization in the English system and is a pre-requisite for a "dr. n. med." which is usually defined within the same field. Romanian medical programs last for 6 years (including clinical practice), which is the long-cycle first professional degree and concludes with a final licensing examination (licența), based on the dissertation of the student's original research. The degree awarded is 'Doctor-Medic' and graduates are entitled to use the title "Dr."
In Russia, the title of Doctor of Medicine (Russian: доктор медицинских наук, "doktor medicinskix nauk", literally "Doctor of Medical Sciences", abbreviated д. м. н.) is a higher doctoral degree, which may be earned after the Candidate of Medical Sciences (the latter is informally regarded in Russia as equivalent to the Ph.D.). Medical universities in Russia offer a six-year curriculum leading to award a professional graduate degree, called qualification (degree) [ru] of "specialist" (Diploma of Specialist; in medicine, Diploma of Physician). In Serbia, MD degree is awarded upon completion of six years of study at a Faculty of Medicine immediately after high school. The American Duke University has a medical school based in Singapore (Duke-NUS Medical School), and follows the North-American model of styling its first professional degree "Doctor of Medicine" ("MD"), consid. By contrast, the Yong Loo Lin School of Medicine at the National University of Singapore confers MB BS as the first professional degree. In Slovenia, the title of "doktor medicine" (abbreviated "dr. med.") is awarded upon completion of six years of study at one of the two Slovenian Faculties of Medicine ("medicinska fakulteta") in Ljubljana or Maribor. Studying at these faculties is only possible if the student has finished a gymnasium/grammar school ("gimnazija") with a general diploma called "splošna matura". In South Korea, there is a Medical Doctor (MD) license. The medical educations in South Korea (Republic of Korea) are 6 or 4 years in duration, 6-year courses starting right after high schools, and 4-year course starting after 4-year's university education (to start the 4-year course, the student needs a bachelor's degree). The first 2 years in the 6-year system is composed of basic sciences and liberal art courses. In Taiwan, the MD is a first awarded professional degree that goes up and beyond the limits of upper education. The Thai medical education follows the 6-year European system, consisting of 1 year in basic-science, 2 years in pre-clinical training, and 3 years for clinical training. Upon graduation, all medical students must pass national medical licensing examinations and a university-based comprehensive test. After medical school, newly graduated doctor are under contract to spend a year of internship and 2 years of tenure in rural areas before they are eligible for any other residency positions or specialized training. The students will receive Doctor of Medicine (MD) degree. However, the degree is equivalent to master's degree in Thailand. Specialty training after the MD degree requires at least 4–6 years residency program in the training university hospitals and must pass the board examination. Board certified specialized degree is equivalent to doctorate degree. In Tunisia, education is free for all Tunisian citizens and for foreigners who have scholarships. The oldest Medical school is a faculty of the University of Tunis. There are four medicine faculties situated in the major cities of Tunis, Sfax, Sousse and Monastir. Admission is bound to the success and score in the baccalaureate examination. Admission score threshold is very high, based on competition among all applicants throughout the nation. Medical school curriculum consists of five years. The first two years are medical theory, containing all basic sciences related to medicine, and the last three years consists of clinical issues related to all medical specialties. During these last three years, the student gets the status of "Externe". The student has to attend at the university hospital every day, rotating around all wards. Every period is followed by a clinical exam regarding the student's knowledge in that particular specialty. After those five years, there are two years on internship, in which the student is a physician but under the supervision of the chief doctor; the student rotates over the major and most essential specialties during period of four months each. After that, student has the choice of either passing the residency national exam or extending his internship for another year, after which he gains the status of family physician. The residency program consists of four to five years in the specialty he qualifies, depending on his score in the national residency examination under the rule of highest score chooses first. Whether the student chooses to be a family doctor or a specialist, he has to write a doctoral thesis, which he will be defending in front of a jury, after which he gains his degree of Doctor of Medicine (MD). In Turkey, the title of "Tıp Doktoru" (literally "Doctor of Medicine")is awarded upon completion of six years continuous study started with five years university education include three years basic sciences, two years clinical courses followed by one year of internship in university hospitals. In Ukraine, by 2018, graduates of the school with completed secondary education who have cope with the relevant exams (in the disciplines designated by these universities) in the nationwide system for assessing graduates' knowledge - EIT (Ukrainian: ЗНО, External independent testing) based on the rating - may be admitted to the Medical Universities. Ukrainian medical universities offer a 6-year curriculum, which should end with the passing of the State Complex Examination. The graduate receives the Diploma of the State Standard with the title "Specialist Diploma", which specifies a specialty and qualification (for example, "Physician"), or "Magister's Diploma" also of a state standard. After that, the graduate according to the rating division (at the university) is required to undergo a practical internship course (working as a doctor under the supervision of an experienced doctor) with a duration of 2 to 3 years, in the corresponding specialty. Successful completion of internship implies that an intern passes an examination on a specialty, including testing  and receives a certificate of a specialist physician of the Ministry of Health, which is a formal permission for practical activity. Thus, the American MD and the Ukrainian Physician have identical titles. On the other hand, the colloquial (not official terminology) Doctor of Medicine means that a Physician with a higher education successfully defended his thesis, after a 2-year postgraduate course and corresponding term of research (Candidate of Medical Sciences before 2015, or Ph.D. after 2015 - till 2020), which is closer to the English system of degrees. In the United States, the M.D. awarded by medical schools is a "Professional Doctorate" (as opposed to the Doctor of Philosophy degree which requires a focus on research) and is accredited by the Liaison Committee on Medical Education (LCME), an independent body sponsored by the Association of American Medical Colleges, and the American Medical Association (AMA). Admission to medical school in the United States is highly competitive, and in the United States about 17,800 out of approximately 47,000 applicants (~38%) received at least one acceptance to any medical school in recent application years. [vague] Before entering medical school, students are required to complete a four-year undergraduate degree and take the Medical College Admission Test (MCAT); however, some combined undergraduate-medical programs exist. Before graduating from a medical school and being awarded the Doctor of Medicine degree, students are required to take the United States Medical Licensing Examination (USMLE) Step 1 and both the clinical knowledge and clinical skills parts of Step 2. The MD degree is typically earned in four years. Following the awarding of the MD, physicians who wish to practice in the United States are required to complete at least one internship year (PGY-1) and pass the USMLE Step 3. In order to receive board eligible or board accredited status in a specialty of medicine such as general surgery or internal medicine, physicians undergo additional specialized training in the form of a residency. Those who wish to further specialize in areas such as cardiology or interventional radiology then complete a fellowship. Depending upon the physician's chosen field, residencies and fellowships involve an additional three to eight years of training after obtaining the MD. This can be lengthened with additional research years, which can last one, two, or more years. Even though the M.D. is a professional degree and not a research doctorate (i.e., a Ph.D.), many holders of the M.D. degree conduct clinical and basic scientific research and publish in peer-reviewed journals during training and after graduation; an academic physician whose work emphasizes basic research is called a physician-scientist. Combined medical and research training is offered through programs granting an MD-PhD. The National Institutes of Health (NIH), through its Medical Scientist Training Program, funds M.D.-Ph.D. training programs at many universities. Some M.D.s choose a research career and receive funding from the NIH as well as other sources such as the Howard Hughes Medical Institute. The United States Department of Education and the National Science Foundation do not include the M.D. or other professional doctorates among the degrees that are equivalent to research doctorates. After graduating from high school in Venezuela students can apply for federal appointment to a six year medical program within an University. Only Public Universities offer this degree in Venezuela. Any student can apply for federal appointment by Ministry of Higher Education. So that, the student is allowed to register at university and follow a medical program. This a six year program divided within three cycles. First cycle: Theory and lectures (1-2), second cycle: pre-clinical training (3-4) and third cycle: clinical training (5-6). First year consists mainly of theoretical classes, however there are practice since first day in laboratories and institutes, such as biochemistry, anatomy which included lectures and teaching sessions with cadavers in dissection tables, Molecular Biology, histology, embryology and many others general subjects. The second year is usually mainly quite theoretical although most teaching sessions takes place in laboratories. After completing these years the student know how the human body is and how it works. Also, any extrinsic agent that can modify its functions. There is also Medical Exercise demonstration which included guided visit to primarily care centers during a complete semester or year-round depending on universities. During third year medical students start studying pharmacology, pathology and physical examination. Passing successfully first, second and third year is commonly considered a filter, almost half of previously admitted students leave voluntarily. The fourth year medical students enter on the field starting to visit hospitals and healthcare services. This is called Pre-Clinical Cycle were they acquire deep knowledge about clinical examination visiting specialized units such as Internal Medicine, Trauma and orthopedics, surgery and gynecology and obstetrics. They start to be member of a medical team. Every morning at the hospital, plus one night shifts per week, and lectures in the afternoon. Each internship lasts between six and four months and takes place in a different department. The fifth and sixth year are very similar but this time they applied their previously earned clinical knowledge and skills starting to follow patients independently. At the end of the sixth year, they need to pass a highly supervised medical practice examination in an unserved outpatient center or specialized hospital in order to earn the degree. During these years, there is training at the hospital almost exclusively. Very little theoretical courses are meant to balance the training. Once completed they earn an university degree and a title granted by the Bolivarian Republic of Venezuela as "Medical Surgeon" this is considered equivalent to a M.D degree..
After graduation, recently graduate doctors acquire the right to use Dr. before their names but still must follow a one year exercise in the countryside or a two years training in a specialized hospital. So that, They can be enabled to practice medicine with a full licence in Venezuela and the right to work as a medical doctor, generally as a general practitioner (Artículo 8). That is the point from which they also start getting paid. They can follow specialized studies which usually last between 3 or 5 years depending on specialization  and furthermor a phD for relevant research activities which usually take at least three years more. The MBBS (Bachelor of Medicine/Bachelor of Surgery) degree represents the first (undergraduate) level of training required to be licensed as a physician (other degrees in alternative medicine are present like BAMS, BHMS, BSMS etc.) and the MS or MD degree is a postgraduate degree, representative of specialty training. The equivalent training in the US or Canada would be the completion of a medical (post-graduate) degree. Eligibility for the MS or MD course is restricted to medical graduates holding the MBBS degree. Clinical (Ophthalmology, Otorhinolaryngology, General Medicine, General Surgery, Pediatrics and Obstetrics/Gynecology; with specialty rotations such as Orthopaedics, Radiology, etc.). After three years of study and the successful completion of an examination, which includes both theoretical and practical elements, in a pre-clinical or clinical subject of a non-surgical nature [e.g. Anatomy (since the subject deals with study of anatomy through dissecting cadavers, thus given an MD degree), Physiology, Pharmacology, Internal Medicine, Pediatrics, Pathology, Microbiology] the candidate receives MD degree, whereas in a clinical subject of a surgical nature (e.g. General Surgery, Orthopaedics, Obstetrics/Gynaecology, Ophthalmology), the candidate receives the equivalent degree Master of Surgery (MS). A second alternate qualification termed DNB [Diplomate of National Board], is considered equivalent to the MD and MS degrees. This can be obtained by passing the exam conducted by the National Board of Examinations after completing 3 years of post-MBBS residency training in teaching hospitals recognised by the board. The College of Physicians & Surgeons of Bombay, India (Established 1912) also awards higher postgraduate degrees in clinical and pre-clinical specialties, called FCPS; it involves three years of study and the successful completion of an examination, which includes both theoretical and practical elements, and a research thesis and a viva. The FCPS is representative of specialty clinical training, and equivalent to MD/MS/DNB/Ph.D Medical in Medical Doctorate in other parts of the world. Until 2007, the Government of India and the Medical Council of India recognised the FCPS qualification - since then, this is being done by State Medical Councils. After obtaining the first postgraduate degree, that is MD/MS/FCPS/DNB/Ph.D Medical, one can go for further specialisation in medical or surgical fields. This involves a highly competitive entrance examination. This course has three years of additional training and requires the submission of a dissertation (thesis). This is considered a clinical doctorate as the focus is on preapring a super-specialist with adequate clinical as well as research training. After the dissertation is approved and the exit examination (theory and practical) is cleared, the degree awarded is DM (Doctor of Medicine), Ph.D Medical . Based on the specific field of training, the degree awarded is DM in Cardiac Anaesthesia, Cardiology, Neurology, Nephrology, Gastroenterology, Neuroradiology, Critical Care, Pulmonology, Hematology, Medical Oncology, Clinical Pharmacology, Pediatric Critical Care, Pediatric Neurology, Neonataology, Pediatric Gastroenterology, Neuroanaesthesia, etc. For surgical superspecialities the degree awarded is MCh (Magister Chirurgiae), like MCh in Cardio-thoracic and Vascular Surgery, Endocrine Surgery, Neurosurgery, Surgical Gastroenterology, Urology, Plastic Surgery, Pediatric Surgery etc. DM and MCh are the clinical equivalent of a Doctorate degree. A third alternate qualification is DNB (superspecialties), offered by National Board of Examinations, like DNB in Cardiology, Neurology, Cardiac Surgery, Neurosurgery. Following DM or MCh, one can further go for postdoctoral fellowship programs of one-year duration in specific subspecialties like Cardiac Electrophysiology, Invasive cardiology, Pediatric cardiology, Epilepsy, stroke, electroencephalography, movement disorders, neuromuscular disorders, cerebrovascular surgery, skull base surgery, neurocritical care, pediatric cardiac surgery etc. offered by prestigious government institutes and abroad. In Pakistan the MD is a higher doctorate, awarded by medical universities based on successful completion of a residency program of four to six years' duration in a university hospital.Many universities are offering MD. Parallel to MD, MS is a higher doctorate awarded on successful completion of four to six years' duration of a residency program in surgical field. In Sri Lanka, the MD degree is a higher postgraduate degree that is awarded by the Postgraduate Institute of Medicine after completion of a postgraduate course, examinations and speciality training. The MD degree in Sri Lanka is representative of specialty training in clinical, para clinical, and preventive medicine (e.g., general medicine, cardiology, nephrology, oncology, para clinical such as microbiology, haematology and preventive such as community medicine). Entry for the MD course is open only for medical graduates holding the MBBS degree (with a duration of five and a half years), and training is obtained in medical disciplines that are non-surgical in nature (e.g., internal medicine, radiology, pathology, etc.) After three or four years of study and the successful completion of an examination with written as well as cases and via examinations, the MD degree in the respective field of study is awarded. In community medicine and medical administration, part I examination consists of a theoretical exam while the degree is conferred after completion of a thesis as a PhD. This thesis has to be completed within a period of five years. After successfully defending the academic thesis, the MD degree is conferred to the candidate. The MD degree holder is certified as a board certified specialist by the respective board of study of the Postgraduate Institute of Medicine after he or she undergoes 2–4 years of local and foreign training depending on the specialty/subspecialty selected. In Ayurveda, Bachelor of Ayurveda, Medicine and Surgery B.A.M.S in Unani, Bachelor of Unani Medicine and Surgery BUMS in Sidha, Bachelor of Sidha Medicine and Surgery BSMS are the basic qualification for practicing Ayurveda, Unani,&Sidha. The B.A.M.S, B.U.M.S, and B.S.M.S are 6-year degree (including internship) courses accepted by the University Grants Commission (Sri Lanka). M.D (Ayu)(Ayurveda vachaspati) can be done after B.A.M.S, as a specialty, and it takes 3 years (including submission of a thesis) to complete the course. Ayurveda M.D (Ayu) (Ayurveda vachaspati) is a master's degree accepted by University Grants Commission (Sri Lanka), after completion of MPhil can follow Ph.D. level programmes in Sri Lanka. The entry-level first professional degree in these countries for the practice of medicine is that of Bachelor of Medicine and Bachelor of Surgery (MBBS, MB, MB BCh BAO, BMBS, MBBChir, or MBChB). This degree typically requires between four and six years of study and clinical training, and is equivalent to the North American MD degree. Due to the UK code for higher education, first degrees in medicine comprise an integrated programme of study and professional practice spanning several levels. These degrees may retain, for historical reasons, "Bachelor of Medicine, Bachelor of Surgery" and are abbreviated to MBChB, MBBS or BMBS. In the UK, Ireland and many Commonwealth countries, the MD is a postgraduate research degree in medicine. At some universities, this takes the form of a first doctorate, analogous to the Ph.D., awarded upon submission of a thesis and a successful viva. The thesis may consist of new research undertaken on a full- or part-time basis, with much less supervision (in the UK) than for a Ph.D., or a portfolio of previously published work. In order to be eligible to apply for an MD degree from a UK or Commonwealth University one must hold either a "Bachelor of Medicine, Bachelor of Surgery" (MBBS, MBChB, BMBS for example) degree, or an equivalent U.S.-MD degree and must usually have at least five years of postgraduate experience. Therefore, graduates from the MBBS/MBChB/BMBS degrees do not hold doctorates; however, physicians holding these degrees are referred to as "doctor" as they are fully licensed as medical practitioners. In some commonwealth nations, these interns are designated as "house officers". At some other universities (especially older institutions, such as Oxford, Dublin, Cambridge and St Andrews), the MD is a higher doctorate (similar to a DSc) awarded upon submission of a portfolio of published work representing a substantial contribution to medical research. The University of Cambridge has introduced a new degree of MedScD (more akin to the ScD degree) awarded on the basis of a career's contribution to the science or art of medicine, rather than a thesis, for which a candidate may be awarded the MD degree. Oxford did not do the same but instead demoted the rank of the degree the same level as the DPhil but retaining its original academic dress. In the case where the MD is awarded (either as a first or higher doctorate) for previously published research, the candidate is usually required to be either a graduate or a full-time member of staff, of several years' standing of the university in question. In Bangladesh, the basic medical degree is the MBBS. After completing the intermediate level of education (12 years) the candidate must undergo 5 years of medical training in any medical college to achieve the MBBS degree. After obtaining the degree, the candidate needs to undergo one year of internship to obtain BMDC (Bangladesh medical and dental council) accreditation in order to practice in the country. In mainland China, some medical schools award MBBS to foreign students while all medical schools award Bachelor of Medicine to nationals. Some MD degrees are higher academic research degrees. In Colombia, the medicine faculties of the universities awards the title of "Medico Cirujano" after taking 12 semesters of studies on "all clinic and surgery discipline a two semester on internship. After receiving the degree there is a mandatory year "obliged social work" were the doctors practice as GP in the countryside. Residency programs last between 3–4 years depends on the specialty. The Czech and Slovak title MUDr. (Medicinae Universae doctor or doktor medicíny) is a professional doctorate granted upon completion of six years pregraduate Master's study at medical schools. The postgraduate academic research degree in medicine is a PhD degree. The Danish and Norwegian Candidatus medicinae or Candidata medicinae degrees (cand. med.) is awarded after completing a six-year medical programme, to which students apply directly upon finishing secondary school. The programme usually includes a small thesis. However, the cand. med. degree must not be confused with the previous Danish and Norwegian Dr. Med. degree, which is a separate degree from the Ph.D. and represents a higher degree of medical research experience. It typically consists of at least 5–6 original publications. In Finland, the duration of basic medical education is six years and the course leads to the degree of Licentiate of Medicine. In Greece, after a six-year study, a medical student acquires his medical degree and the right to use "Δρ. ", (Dr.) before his name. This is considered equivalent to the MD title. In Kosovo, there are medical high schools. Students from elementary school can choose to attend the medical high school, which lasts 3 years. When they finish the 3 years of medical high school, they practice for 4 months. After that, they can be a nurse or they can go to medical facilities in Pristina, with the education there taking around 6 years, including practice, to become a doctor. In Mexico and Peru, schools of medicine award the "Título de Médico Cirujano" degree after completing either six or seven years of study. This curriculum includes a rotating internship year and a year of social service providing care to an underserved community. In Nepal, a MBBS degree is awarded. This is an undergraduate level degree, which is awarded after completion of four and half years of medical school followed by one year of clinical internship. Most medical schools also offer postgraduate M.D and M.S. degrees, which requires three years of further training. Post-doctorate D.M. and M.Ch. terminal degrees are awarded by a few elite institutions after three more years of super-speciality training. In the Netherlands, medical students receive six years of university education prior to their graduation. Prospective students can apply for medical education directly after finishing the highest level of secondary school, vwo; previous undergraduate education is not a precondition for admittance. Medical students receive three years of preclinical training, followed by three years of clinical training (co-assistentschappen, or co-schappen) in hospitals. At one medical faculty (Utrecht University), clinical training already begins in the third year of medical school. After 6 years, students graduate as Basisartsen ("base physician"). As a result of the Bologna process, medical students in the Netherlands receive a bachelor's degree (BSc) concluding successfully three years of medical university curriculum, and a master's degree (MSc) upon successful graduation. After graduation, physicians can apply for, and complete a R&D based doctorate, earning them a PhD in Medicine. Contrary to popular (international) daily use, the title "MD" does not exist, is not granted, nor recognised for Dutch physicians. Furthermore, no specific notation signifying board registration exists for physicians in the Netherlands. In Belgium, Belgian medical education is much more based on theoretical knowledge than the Dutch system. In the first three years, which are very theoretical and lead to a university bachelor's degree, general scientific courses are taken such as chemistry, biophysics, physiology, biostatistics, anatomy, virology, etc. To enter the bachelor course in Flanders, prospective students have to pass an exam, as a result of the numerus clausus. After the bachelor courses, students are allowed to enter the 'master in medicine' courses, which consist of three years of theoretical and clinical study. In general, the first two master years are very theoretical and teach the students human pathology, diseases and pharmacology. The third year is a year full of internships in a wide range of specialities in different clinics. The seventh, final year serves as a kind of 'pre-specialization' year in which the students are specifically trained in the specialty they wish to pursue after medical school. This contrasts with the Dutch approach, in which graduates are literally 'basic doctors' (basisartsen) who have yet to decide on a specialty. In Portugal, to practice medicine, a master's degree in medicine (awarded after a 6-year Integrated master's program in medicine) is mandatory. Before the 2007 Bologna Process, the same course was only a Licentiate Degree. After the 6-year program, students must go through the National Seriation Exam (Prova Nacional de Seriação), and then a year of General Medical Internship (Ano Comum). When the internship ends, the students are placed in their choice of Medical Specialty, according to their ranking in the aforementioned Exam and the vacancies available for each medical specialty. Only when each student finishes the Medical Internship, will they be allowed to practice medicine without supervision. Entry to the Integrated Masters Program in Medicine is done directly after High School, based on the student's grade - each year there are about 1800 new Medical Students in Portugal, in 8 different Medical Schools. In Sudan the awarded degree in most of the medical schools is, Bachelor of Medicine and Basic Surgery (MBBS). In schools that are based on the English system of medical teaching, the degree is granted after six years of studying. As for the schools that are adopting the American system, they grant their students the degree of MBBS in only five years. In Sweden, medical education begins with a five-and-a-half-year undergraduate university program leading to the degree "Master of Science in Medicine" (Swedish: Läkarexamen). Following this, the National Board of Health and Welfare requires a minimum of 18 months of clinical internship (Swedish: Allmäntjänstgöring) before granting a medical license (Swedish: Läkarlegitimation) to be fully qualified as the Swedish equivalent to Medical Doctor (MD). This internship consists of surgery (3–6 months), internal medicine (3–6 months), psychiatry (three months) and family medicine (six months). Upon receiving a license to practice, a physician is able to apply for a post to start specialist training. There are currently 52 recognised medical specialties in Sweden. The specialist training has a duration of minimum five years, which upon completion grants formal qualification as a specialist. There is also a similar advanced professional degree to the postgraduate MD: the Master of Surgery (usually ChM or MS, but MCh in Scotland, Ireland, Wales and at Oxford and MChir at Cambridge). The equivalence of these degrees, but their differing names, prevents the need for surgeons (addressed as Mr. in the UK) having to revert to the title Dr., which they once held as new MBBS graduates. In Ireland, where the basic medical qualification includes a degree in obstetrics, there is a similar higher degree of Master of the Art of Obstetrics (MAO). A Master of Midwifery was formerly examined by the Worshipful Society of Apothecaries of London (hence MMSA) but fell into abeyance in the 1960s; in this case, the term Master referred not to a university degree but rather a professional rank that is common among craft guilds. In East Africa, the medical schools in Kenya, Tanzania and Uganda award the degree of Master of Medicine (MMed) degree in both surgical and medical specialty disciplines following a three to six-year period of instruction. In West Africa, the West African College of Physicians and the West African College of Surgeons award the Fellowship of the West African College of Physicians (FWACP) and the Fellowship of the West African College of Surgeons (FWACS) in medical and surgical disciplines respectively after a minimum of four-year residency training period. ^ "ECFMG 2008 Information Booklet — Reference Guide for Medical Education Credentials". ^ "A Significant Medical History: 18th Century". University of Glasgow. Retrieved 10 April 2016. ^ "History | Columbia University in the City of New York". Columbia.edu. Retrieved 2015-03-31. ^ "Crawford DS Montreal, medicine and William Leslie Logie:McGill's first graduate and Canada's medical graduate. 175th.anniversary" (PDF). Osler Library Newsletter. Mcgill.ca: 1–7. Retrieved 2015-03-31. ^ "The Medical Profession: What Women Have Done in it" (1). Godey's Lady's Book and Magazine. January 1864. ^ "New England Female Medical College". The Boston Herald. March 3, 1864. ^ Samuel Gregory, MD. (1868) Doctor or Doctress? Boston: Trustees of New England Female Medical College. ^ "Doctor of Medicine (MD)". University of Melbourne. 15 January 2014. Retrieved 5 July 2014. ^ Охридски, Софийски Университет Св. Климент. "Medicine (in English language) / Faculty of Medicine / Master's Programmes / Programmes / Faculty of Medicine / Faculties / The University / Home - Софийски университет "Св. Климент Охридски"". www.uni-sofia.bg. ^ "Admission Overview of the M.D. program". mu-varna.bg. ^ Wang, Z.; Yin, Z.; Wei, Y. B.; Liu, L. F.; Yang, J. R. (2015). "The expansion of 8-year medical training programs in China: A status report". Medical Education Online. 20: 10.3402/meo.v20.25890. doi:10.3402/meo.v20.25890. PMC 4320996. PMID 25661499. ^ "University and degree systems in France" (PDF). Af-ksa.com. Archived from the original (PDF) on 2015-10-19. Retrieved 2015-03-31. ^ "About | Faculty of Medicine in the Galilee Bar-Ilan University". Medicine.biu.ac.il. Retrieved 2013-09-18. ^ "Home | Sackler Faculty of Medicine". Sacklermedicine.us. 2013-07-22. Retrieved 2013-09-18. ^ "Medical degrees in Israeli Educational System" (PDF). Handouts.aacrao.org. Archived from the original (PDF) on 2015-08-07. Retrieved 2015-03-31. ^ "Medical school". Rīga Stradiņš University. Retrieved 30 July 2017. ^ "The European Education Directory". EuroEducation Net. Retrieved 2 July 2012. ^ "AVICENNA Directories: Romania". University of Copenhagen. Retrieved 2 July 2012. ^ The Russian Academy of Sciences (2007). "Список сокращений" [List of abbreviations]. Справочник. Часть II [Reference book, Part II] (in Russian). Moscow: Nauka. ^ "Федеральный закон Российской Федерации № 125-ФЗО "О высшем и послевузовском профессиональном образовании"" [Federal Law of the Russian Federation No. 125-FZO – "On Higher and Postgraduate Professional Education"]. Минобрнауки.рф (in Russian). March 1, 2012. Retrieved April 2, 2019. ^ International Qualifications Assessment Service (IQAS) (2016). The International Education Guide for the assessment on education from the former USSR and the Russian Federation (PDF). Canada. ISBN 978-0-7785-6987-9. ^ "Duke-NUS Medical School Singapore". Duke-nus.edu.sg. Retrieved 2015-03-31. ^ 臺灣大學醫學校區青年大使團. "臺灣大學醫學校區青年大使團: Introduction of the Taiwanese Medical System[中文+英文]". Ntumc-studentambassadors.blogspot.com. Retrieved 2015-03-31. ^ "Doctor of Medicine as Professional Doctorate" (PDF). Wblearning-ejournal.com. Retrieved 2015-03-31. ^ "Educational System in the USA". Nces.ed.gov. Retrieved 2015-03-31. ^ "Physician Education, Licensure, and Certification". Ama-assn.org. Archived from the original on 2011-05-08. Retrieved 2011-05-05. ^ "NRMP: Residency Match: U.S. Seniors". Nrmp.org. Archived from the original on 2003-10-07. Retrieved 2011-05-05. ^ "Structure of the U.S. Education System : Research Doctorate Degrees". Ed.gov. Archived from the original on 2012-01-27. Retrieved 2015-03-31. ^ "ERC policy on PhD and equivalent doctoral degrees" (PDF). Erc.europa.eu. Retrieved 2018-12-11. ^ "Planification Office of Higher Education in Venezuela" (HTML). Ministry of Higher Education. Retrieved 2019-02-22. ^ "Book of University Study Opportunities in Venezuela" (HTML). Ministry of Higher Education. Retrieved 2019-02-22. ^ "Educación médica en América Latina: Venezuela - Medical education in Latin America: Venezuela" (HTML). ELSEVIER Educación Médica. Retrieved 2019-02-22. ^ "Study Program" (PDF). University of Zulia. Retrieved 2019-02-22. ^ "Study Program" (PDF). University of the Andes. Retrieved 2019-02-22. ^ "University of Zulia Medical Program Overview" (PHP). University of Zulia. Retrieved 2019-02-22. ^ "Medical Exercise Law in Venezuela" (PDF). Gaceta Oficial. Retrieved 2019-02-22. ^ "Post Graduate Medical Specialization at the Central University of Venezuela" (HTML). Central University of Venezuela. Retrieved 2019-02-22. ^ "The framework for higher education qualifications in England, Wales and Northern Ireland" (PDF). Qaa.ac.uk. Retrieved 2015-03-31. ^ "Doctor of Medicine (MD), University of Otago, New Zealand". Otago.ac.nz. Retrieved 2015-03-31. ^ "Reports - Cambridge University Reporter 6248". Admin.cam.ac.uk. 2011-12-07. Retrieved 2013-07-15. ^ "Courses and Programs - The University of Queensland, Australia". Uq.edu.au. Archived from the original on 2015-04-02. Retrieved 2015-03-31. ^ "License to practice medicine in Sweden". Socialstyrelsen.se. Retrieved 2015-03-31. ^ "United States Medical Licensing Examination | USMLE Bulletin | Eligibility". www.usmle.org. Retrieved 2018-06-27. ^ "The Single GME Accreditation System". www.osteopathic.org. Retrieved 2018-06-27. ^ "DOs Around the World". archive.is. 2012-09-06. Retrieved 2018-06-27.